Now that more people are better understanding the benefits of solar, their attention turns to looking at solar for their business. However, a lot of people are still unsure as to how to determine the size they’ll need and what added components are required for a commercial install. 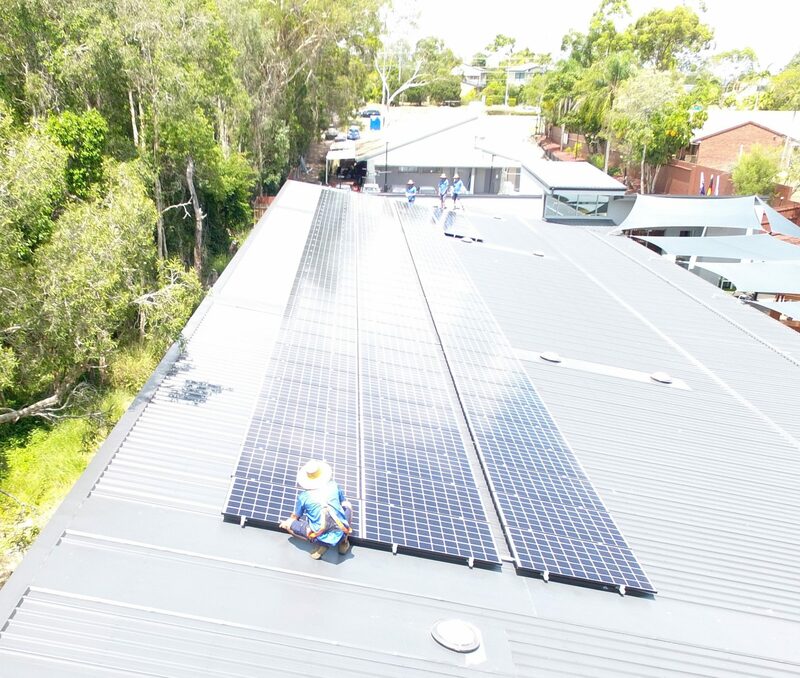 This post first aims to cover the benefits of small commercial solar Brisbane (bills less than $3000 a month) and how it can boast payback periods superior to residential installations. Next, we’ll give you three reasons why commercial solar can actually be cheaper per kW than residential solar. Lastly, we’ll discuss the Sweet Spots of commercial solar, explaining how size plays an important role in the cost of the system. Small commercial solar nearly always has a better payback period than residential solar. The reason behind this is simple – most commercial premises operate within ideal solar production hours. Since we recommend and install consumption monitoring on all of our commercial installations, I am able to share a few images below to help illustrate this point nicely. The green portion is excess production exported to the grid for 10-20c per kWh. The grey portion is usage covered directly by the solar, worth 20-30c per kW. The more power usage that is directly covered by the solar, the better the savings. So it’s quite clear to see that most commercial premises follow this higher, more daytime concentrated usage in comparison to residential premises. This, in turn, enables them to achieve exceptional payback periods and larger overall savings. 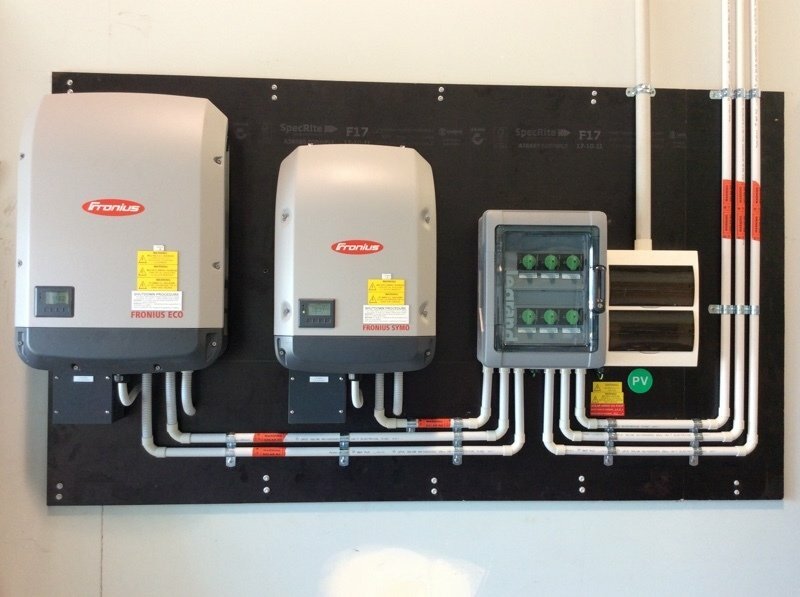 Although most inverters can handle 1000V worth of panels, residential regulations limit us to 600V DC. This means we can’t install any more than 12 – 14 panels before requiring an additional string. This results in additional labour and materials. However, premises defined as commercial have a 1000V limit. This means when designing commercial solar, we can install strings of 20 – 24 panels, which can greatly reduce material and labour costs. There are inverters designed specifically for commercial applications. They can be heavily limited in design, often requiring the perfect number of panels in identical strings to get them operational. This design limitation does, however, result in a lower price point, so we need to find the correct application to use them. Enter commercial rooftops. Since most commercial rooftops have a large available space to install on, design limitations are rarely a factor. We have plenty of space to achieve the appropriately configured array necessary to get the inverter firing. The commercial premises simply benefits from a low cost, high-quality inverter without the drawbacks. We’ve touched on this topic in a previous post. Adding panels to your install is not going to take much more time, and its additional kW contribution to the the system size is going to incur more STCs. More STCs greatly help cover the full price of that panel. This means if we can fit 20 panels easily on a residential roof, this is always going to be a better financial option than installing say 15 or 16 panels. This same concept can be translated directly to commercial solar, but due to larger system sizes, the benefits are significantly more evident. The price for 100 panels, as opposed to 80, is insignificant, but the benefits of those additional 20 panels are proportionally much greater. Our x-axis is the system size (based on total panel capacity), and our y-axis is the price of the system per kW. The trend moves downwards to cheaper pricing as we get larger, then hits a point in which engineering and application fees come into effect. The trend eventually stabilises, and we begin to approach an acceptable system price per kW again. You’ll notice the best price per kW sits at around 33kW. This is because at this point we can use a single inverter, greatly reducing material and labour costs. The 39kW, although slightly more expensive, still usually has a better return. The sharp increase from 40kW onwards is due to the necessary application and engineering costs that come with installing more than 30kW inverter capacity. This creates a “dead zone,” in that installing anything from here until around 60kW is some of the highest charges per kW possible for a system. The few dips at around 60kW, 80kW, and 100kW are due to ideal inverter configurations. These are generally the most cost-effective systems sizes to install when your commercial bill is over $3000 a month. This graph repeats on itself after 100kW, in that price per kW shoots up to a new “Dead Zone.” This is because after 100kW we move from STCs (Small Scale Technology Certificates) to LGCs (Large Scale Technology Certificates) and enter a new realm of engineering costs and application fees. As system sizes increase we eventually approach a new “Acceptable Range” and “Sweet Spot” in much the same trend to the above graph. When applying for systems larger than 39kW, you won’t know if you’ll be approved for exportation until the solar has been installed. This means any payback projections you calculate must consider the possibility of zero export. If zero export is required, your system can never generate more than your consumption. I’m not suggesting this is the end of the world as most of your savings are going to come from direct consumption. But, if your office is closed on weekends, it’s going to sting knowing your huge production is going to be throttled quite a bit. With a 39kW system, you will know before installation whether you are approved for exportation or not. In our experience, a 39kW system is most likely going to be approved either for full export, or at least 15kW export limitation. So we can reap the benefits of those times when the system is generating more than the premises can use. Let’s say your commercial premises is closed on Saturday + Sunday. You have a 39kW system plodding away producing an average of 156kWh a day. You still keep your fridges, alarms and other bits and pieces on when you’re closed. Perhaps you export 130kWh a day, or 260kWh every weekend on average. You’ve gone with a retailer offering 14c per kWh, so you’re being credited $36.40 every weekend on average. That’s $1892.80 per year in feed in alone. Remember this is just for weekends. There’s going to be plenty of days during the week where you will produce more than you are using, so this figure in reality will be higher. This would not be possible in a zero export scenario. 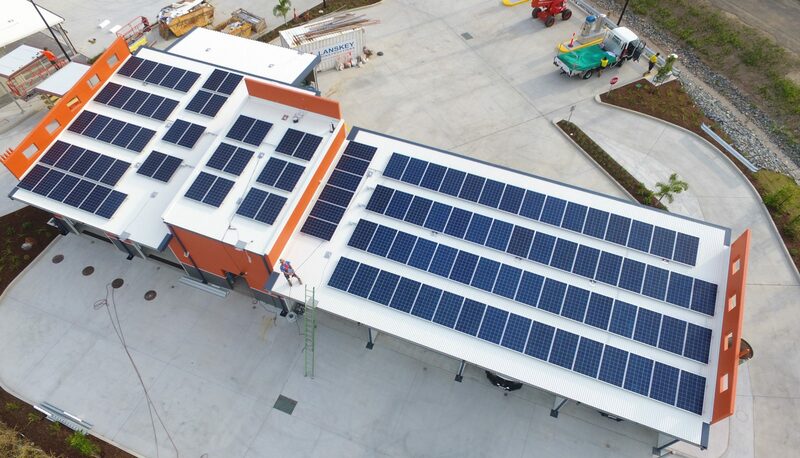 A commercial solar system in brisbane that operates in the day time is going to pay for itself in a shorter time frame than a residential system. 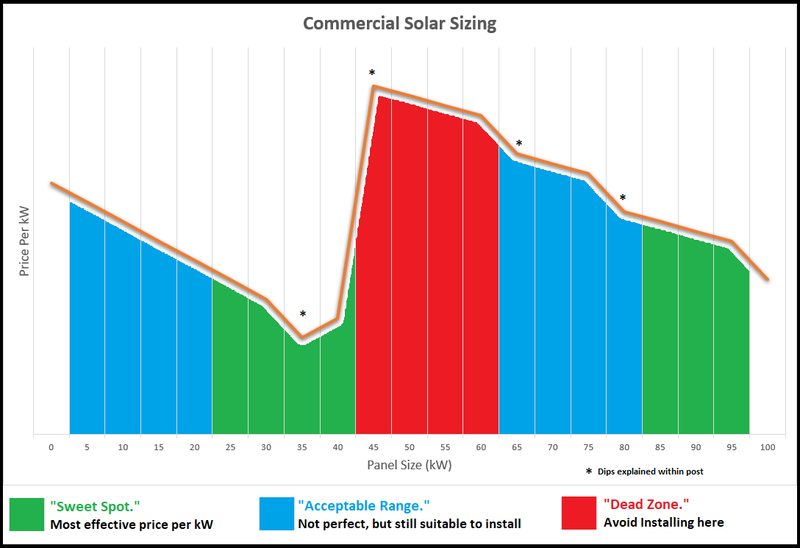 This is due to a consistent load profile that matches solar consumption, the lower price per kW as we increase in system size, and a few other labour and material factors that comes into effect at these larger sizes. 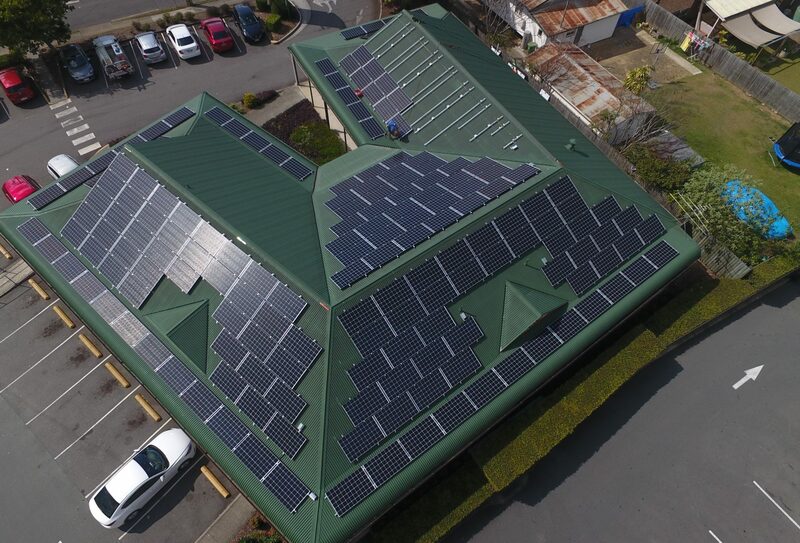 A 39kW system is generally the sweet spot for a small commercial application. This is the size where we just avoid engineering costs, application fees, and zero export possibilities which blow the price per kW out the water. We will also have an early indication of exportation approval at which can greatly improve payback projections. Thanks Nisha, More posts to come! Thanks Aaron, I plan to! Hey Ben! Great post! I enjoyed reading your blog, I already bookmark it. 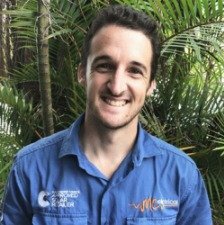 Your content is the very depth information regarding commercial solar Brisbane finding the correct spot and you describe it so well. I appreciate your effords. keep on posting. Awesome post! Love the way you justify your words with the help of graph. I have added you in my friend list. Keep posting! Thanks James! I imagine the graph for residential installs would follow a similar trend, but hit "dead zones" for half day, or one and a half day installs. The most cost effective prices per kW would be focused around the most effective labour costs, i.e. getting the most panels installed in a single day, getting the most panels installed in two days, three days etc. These would be the "Sweet Spots." I may draw one up in the future, sounds interesting. In regards to export approval, I have been told in some cases you can be pre-approved for full or partial export after Energex's initial analysis. 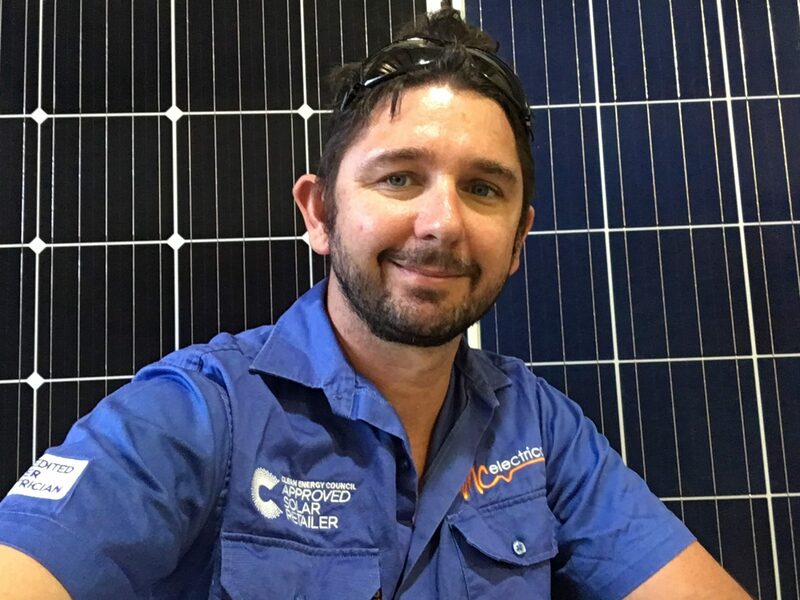 However, in the majority of our cases Energex have declined exportation for over 30kW inverter capacities, but allowed re-assessment after the installation. This reassessment involves Quality Power Control, undertaken by an Engineer post install. I personally do not know what goes into that but since it isn't guaranteed that export approval will occur, we need to consider payback periods with zero export. Awesome post Ben! would love to see that graph for residential!! (both 1 & 3ph ;) Why can't the grid per-approve export up of at least 15KW(3ph) when using over 30KW inverters? Or put another way, if one was to install say a 80KW system, under what condition would the grid allow export - post install? If export limiting is configured correctly, what exactly are they looking for that would allow you to begin exporting (even if only 15KW)?